Our latest publication is now available. 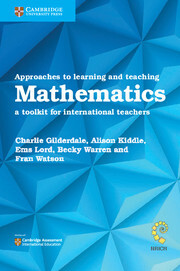 The Secondary team are all experienced classroom teachers and CPD providers, who have drawn upon their expertise to provide a practical, highly accessible guide to maximising the potential of maths activities in the classroom. Each chapter uses research-informed classroom activities from the NRICH collection to illustrate ways in which teachers can enrich their students’ learning of mathematics. The companion website includes a wealth of additional material and practical lesson ideas for teachers. Visit Cambridge University Press to buy your copy!